Black Moth adds topographic feature to its mobile vision and communication system. topVIEW is the latest feature release for Black Moth’s atlas system and provides users an aerial view of the surroundings of their machinery. The additional perspective enables an enhanced view to further reduce the risk of incidents and injuries on work sites. 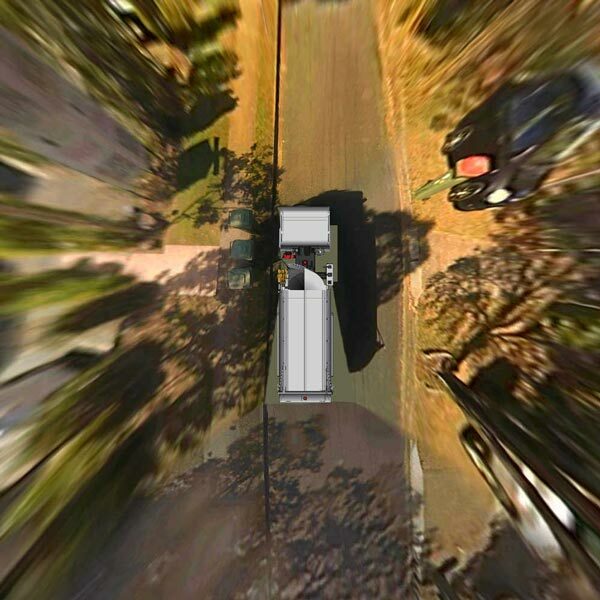 topVIEW uses the video streams of four cameras around the vehicle, stitches them together and displays a view encompassing the entire perimeter of the vehicle. Footage for the distinctive helicopter view is captured with high sensitivity HDR image sensors and fisheye lenses, producing crisp and clear high resolution imagery of any person or object close to the vehicle. Thanks to the low latency of the imagery, the new feature gives a real-time understanding of the situation around the vehicle. With a clear overview of the direct vehicle vicinity, topVIEW allows operators to determine if it is safe to set the vehicle in motion via a single glance at the display. It is also helpful to quickly analyse events around the machine while manoeuvring in tight or congested areas such as construction sites, machinery yards or loading bays. topVIEW is now available as an optional feature for all new and existing atlas system configurations. The mobile vision and communication system is designed to make drivers aware of hazards and avoid incidents by providing blind spot free 360° vision. This leads to improved safety around vehicles and can reduce cost for insurance premiums and claims substantially. The atlas system allows operators to visualise everything around the vehicle at all times. It uses four smartMX-180 IP cameras to create full surround vision and delivers streamed imagery in high definition for efficient and seamless monitoring of operations. A fifth camera can be utilised for any machine specific application, e.g. the lift movements on a mobile crane. The vision server of the system, the tigerMX-5, features comprehensive monitoring and recording capabilities. Its powerful two computers combine vision, recording and fleet operations in one unit. While one computer processes footage, the second computer can run custom applications at the same time without performance limitations. Unmatched connectivity ensures remote access to stored footage via Wi-Fi and 3G phone networks. Offering simple integration with existing systems such as GIS and fleet management, the tigerMX-5 facilitates vehicle centric machine management and vision control, while reducing cab clutter and simplifying driver operation. More information about Black Moth’s atlas system and its features is available at blackmoth.com. Black Moth designs and builds intelligent mobile vision and communication solutions for transport and heavy industries. Based in Brisbane, the technology provider drives innovations to enhance worksite safety for heavy machinery. A dedicated team of industry experts, genuine entrepreneurial spirit and cutting-edge technology enable high-end solutions to support operations in diverse industries. To deliver extremely robust and durable products, Black Moth banks on high quality standards and exclusive in-house development. Customers benefit from tailored solutions, exemplary service and a true partnership approach. For more news and information about Black Moth, please visit blackmoth.com.